Ask any food photographer, and they’ll tell you that food takes a long time to photograph. Especially if you have to style it too. That’s why you don’t see many soufflés around on food blogs—bloggers don’t like posting photos of deflated soufflés. Well, folks, I thought I could do it. I thought I could take a photo of a soufflé before it deflated. Oh well. I’ve failed once or twice before, and now I have something else to add to that list! My dream of photographing a tall soufflé was deflated (har, har). The best part of this dish though, for me, was the caramelized bananas. They’re great! I first had caramelized bananas when I went to San Francisco in September with my brother R. We visited lots of different breakfast places for, well, breakfast. They served caramelized bananas with pancakes, waffles, French toast, and so much more. Super yummy! Beneath the thin, crackly caramel shell is an incredibly warm, soft banana. Lovely. These soufflés were a great way for me to get rid of all the brown bananas I had. I asked around on Facebook and Twitter for ideas of what I could do with brown bananas, and a suggestion for soufflés really jumped out at me. They’re far more elegant than banana bread and much easier to make than people say. To make soufflés all you have to do is make a custard, fold in egg whites, and bake. I don’t know why so many people are scared of them. They’re not scary. After you take them out of the oven they cower in fear of you and shrink! Hardly scary. Frankly, I’m far more scared of hissing yeast (I think I’ve complained about its frightening hissing sounds a few times before on here…). They’re great for dinner parties because the custard can be made a few days in advance and egg whites whip up quickly. They’re also great for celebrating big events—like new blog layouts! Do you guys like it? I’m still fixing glitches (like an awfully slow page loading speed), but it was a weekend DIY project that I think looks pretty good! Easy recipe for banana souffle dusted with icing sugar and served with crunchy caramelized bananas. Brush butter into the ramekins using vertical brush strokes at the walls of the ramekins so that the souffle can follow the butter grooves upward. Pour sugar into one of the ramekins, turn to coat the sides with sugar, and pour the sugar into the next ramekin. Repeat until all ramekins are coated with sugar. 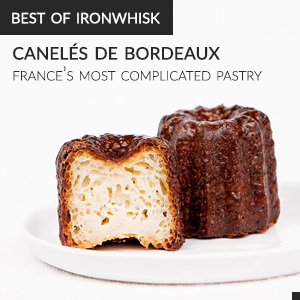 Place in the fridge to chill while you prepare the remaining elements. Put the sugar on a plate and dip the inner, wet side of the banana in the sugar. Place the bananas sugar-side up on a baking tray. Using a kitchen torch, or a torch lighter, heat the sugar until it caramelizes. I tried using a broiler for this step and it doesn't work well because the bananas get too mushy. I highly recommend using a lighter/torch of some sort. Whip together the egg yolks and 50g of sugar until light and fluffy. Heat the milk with the vanilla bean and vanilla caviar until it simmers in a medium sized saucepan. Remove the vanilla bean and very slowly pour the milk into the egg yolks while whisking quickly. Sift in the flour and the cornstarch and whisk together well. Pour back into the saucepan and cook on low heat, whisking often, until thickened. Remove from heat and let cool to room temperature. Once cooled, blend together the rum and the banana and mix into the custard. You can do up to this step in advance. Whisk the egg whites in a clean bowl on medium speed, gradually adding the 25g of sugar. Once the egg whites get to stiff peaks, fold in one third of the banana mixture. Don't be gentle. Once incorporated, fold in the remaining banana mixture as gently as possible to avoid deflating the egg whites. Fill the ramekins up halfway and then hit the ramekins against the counter so that the batter fills in all the edges and rises evenly. Then, fill up the ramekins the rest of the way and use an offset spatula to scrape off the excess mixture and get a flat top. Bake in a 190°C (375°F) oven for approximately fifteen minutes and lightly browned. Don't over-bake or they will collapse in the oven. Do not open the oven door until you're ready to take them out. Dust souffles with icing sugar and place the ramekins on a plate with a couple of pieces of caramelized bananas. I know I’ve run from the oven to my photo set up to try to get a good photo of my souffles :) Your banana version looks terrific! The blog is beautiful and I really like your photography style. Banana soufle sounds delicious and although it’s not as high as you would have preferred, it’s still beautiful. How many servings does this recipe make? What is the size of your ramekins? Thanks Eva! I still have a few things to fix though.. it’s loading too slowly. Anyway, it makes about 6 servings of ramekins about 1/2 cup big. pshhh the souffle looks great, regardless! 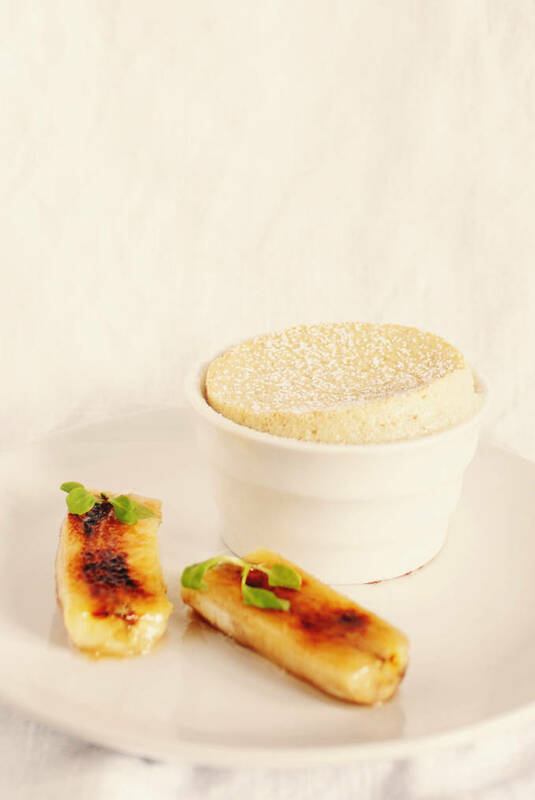 and I LOVE the idea of a caramelized banana souffle!! It looks scrumptious!!! Your souffle looks wonderful! The flavor sounds great too. I had to make a souffle for a paid KitchenAid campaign awhile ago and just about had a meltdown. But they turned out perfect and they didn’t deflate too much. By any chance, did you happen to have artisan toast whilst in San Francisco? Also, I love the pop of green in the photo; it really complements the warm tones. Hey! Maybe.. I had artisan toast. No idea. Ha! And the green isn’t on purpose… oh well! Man, I don’t like bananas at all and these look *awesome*. Haha you are right! Your experience was just like mine!!! I am not sure why my sides are not smooth like yours? Went too high and deflated is that why it’s all bubbly? Love your smooth texture on the side. I didn’t add corn starch. Wonder if that would have helped. I know one day you will come back with another soufflé post with a tall soufflé picture! Love caramelized bananas (I have put in muffins before). What a great soufflé. Id love to try this! I’ve tried photographing a souffle before and ended up burning my finger and then by the time I stopped crying the souffle was decidedly worse for wear. Well done on this one! I’ll bet it tastes fantastic.